Slice ham into approximately 1/2" wide strips. 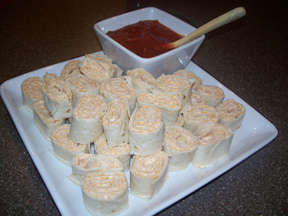 Spread an even, thin layer of cream cheese over the entire surface of the tortilla. Place two strips of ham side by side along the lower third of the tortilla, so that they extend from one end of the tortilla. Line both sides of the ham strips with two strips of red pepper, and then one slice of cheese each; six strips total. 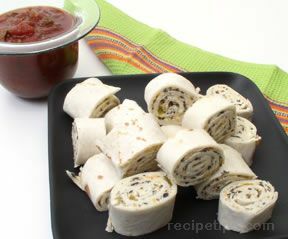 Fold tortilla edge over entire contents and roll tightly.